BALTIMORE - Red Sox manager Bobby Valentine got creative with his lineup when Kevin Youkilis returned to the roster Tuesday night after spending three weeks on the disabled list. Youkilis started at first base against the Orioles with Adrian Gonzalez moving to right field. 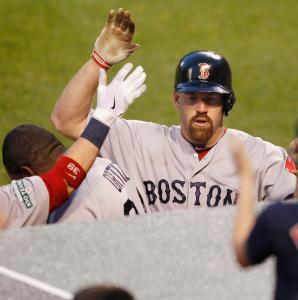 Rookie Will Middlebrooks, who became an important member of the lineup when Youkilis was out, stayed at third base. The idea was to maximize the team’s ability to score runs. Brian Matusz and three relievers foiled that, holding the Red Sox to a season-low two hits as the Orioles won, 4-1, before 25,171 at Camden Yards. The Sox missed a chance to move over .500 for the first time this season. They haven’t gone this deep into a season without a winning record since 1996. The Sox are 4-3 on a road trip that ends this afternoon with Daniel Bard facing Jake Arrieta. Matusz (4-4) allowed one run over 6 1/3 innings and struck out nine, matching his career high. Red Sox starter Felix Doubront (4-2) gave up two runs over six innings and also struck out nine, his career high. The two lefthanders were stellar. “His stuff was working today and so was mine. We had a pretty good duel but he won,’’ Doubront said. Matusz was 1-9 with a 10.69 earned run average last season. He faced the Sox once, on Sept. 19, and gave up six runs before getting pulled in the second inning. But a different pitcher took the mound Tuesday. Matusz threw first-pitch strikes to 17 of the 22 batters and was throwing four pitches for strikes, often to both sides of the plate. Matusz left the mound after striking out Gonzalez to start the seventh inning and received an ovation from the crowd. “I had chills going through my body. It’s such a great feeling to see the fans on their feet like that,’’ he said. Gonzalez, who didn’t have a ball hit to him in right, had a single in the second inning. The only other hit was a home run by Youkilis in the fourth inning. Matusz threw a sinker away that stayed up in the strike zone. It was the third home run of the season for Youkilis, who did not make himself available to reporters after the game. It was one of the few pitches Matusz missed with. The home run was the final hit for the Sox as Darren O’Day, Pedro Strop, and Jim Johnson closed it out. Johnson is 16 for 16 in save chances this season. Doubront easily handled the Orioles outside of the second inning. With a runner on first and one out, Doubront threw a fastball down that Steve Tolleson drove into the Baltimore bullpen in left field. “Good pitch and good hitting, too,’’ Doubront said. Tolleson, a 28-year-old rookie, had appeared in only four games this season. It was the second home run of his career, the first coming in 2010 when he was with Oakland. Tolleson is the son of former major leaguer Wayne Tolleson, who played for Valentine in Texas in 1985. Doubront did not allow another runner past first base, retiring 14 of the final 16 batters he faced. He allowed four hits and walked two. “It was a tough game. I just tried to stay calm and go deep in the game to give our guys a chance to do the job and score some runs,’’ Doubront said. Doubront was surprised to learn that he struck out nine. His previous high was eight. The Sox were within a run until the eighth inning when Matt Albers walked Matt Wieters and Wilson Betemit homered to right. Until the home run, Albers had gone 11 1/3 innings without giving up a run or a hit against his former team since joining the Red Sox before last season. Albers had worked out of a jam in the seventh, striking out Robert Andino and J.J. Hardy after Franklin Morales put two runners on base.